Public participation is a critical input to government decision-making and to developing effective strategies, programs and projects. clearly set out the principles and elements that we use to audit the efficiency and effectiveness of public participation exercises. We developed it following extensive research and consultation with a range of organisations representing different public participation perspectives and experiences, including large government departments, small agencies, local government, community representative organisations and advocacy groups. The term Aboriginal refers to both Aboriginal and Torres Strait Islander people, however, Indigenous is retained when it is part of the title of a report, program or quotation. We refer to Aboriginal peoples to reﬂect the plurality and diversity of Victorian Aboriginal communities. Public participation is a critical input to government activity, and developing effective strategies, programs and projects. Failing to adequately engage the public risks alienating the community and creating negative impacts through poorly informed and implemented decisions. Despite the critical role that public participation plays, I was surprised to ﬁnd that in Victoria there is no whole-of-government guidance or framework that helps agencies plan and implement effective public participation exercises. And yet this is an area that public sector agencies ﬁnd consistently challenging. clearly set out the principles and elements that I will use to audit the efﬁciency and effectiveness of public participation exercises. This guide is not intended to be prescriptive, and does not incorporate mandatory templates or techniques. Agencies need to give signiﬁcant thought to how they will apply the principles in the context of their activities. For example, the public participation process involved in deciding whether to put trafﬁc lights or a roundabout at a local intersection will necessarily differ from processes associated with developing a strategy to address homelessness. The way agencies approach public participation must reﬂect the unique setting of the decision at hand and meet the needs of both decision makers and participants. The process of developing this guide involved extensive research and consultation. It highlighted recurring challenges that public sector agencies face in undertaking public participation exercises. It also revealed that there are a number of agencies who are implementing elements of better practice. Other agencies may ﬁnd value in strengthening their current approaches, as well as exploring the references and resources included in this guide. Publishing this guide is the ﬁrst step in what I intend to be an iterative approach to highlighting better practice public participation in government decision-making. I expect that a number of my performance audits over coming years will include a focus on whether agencies are efﬁciently and effectively engaging the public to inform government decision-making and implementation. In consultation on this guide, agencies have been keen to access tangible examples of better practice, such as case studies of actual public participation exercises. I expect that these future audits will enable me to identify examples of good practice and areas where improvement is required. I will use these audits to update this better practice guide to ensure that the guidance remains as current and useful to agencies as possible. I would like to thank all of the stakeholders that provided input and comment into the development of this guide and am encouraged by the level of interest stakeholders have shown in improving this critical element of public administration. I hope that all public sector agencies will use this guide to plan and implement effective public participation approaches to better inform government in its decision-making and implementation. Why is public participation important? Governments are responsible for decisions that have both intended and often unforeseen impacts on the community. Transparent and well managed public participation is essential to fully inform government policies and their translation into effective strategies, programs and projects. Most governments recognise the value the public bring to understanding problems and risks and crafting solutions that are more likely to work. In addition to the real life experience that community stakeholders can contribute to decision making, the credibility of a decision is enhanced when it is believed to be the product of an open and deliberative process. Conversely, inadequate public participation alienates sections of the community, undermines trust and is more likely to result in poorly informed decisions. 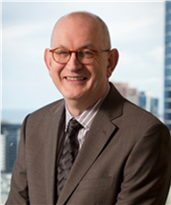 Some governments have introduced better practice guidance to help public sector agencies more consistently and effectively involve the public in decision-making and indeed this is the case for all Australian states and territories except Victoria. Attachment 1 references these guides. While there is currently no whole-of-government guide for Victoria, public participation is embedded or supported in key pieces of Victorian legislation because it makes good sense and is consistent with a system where government spends public funds to benefit the community. The International Association for Public Participation (IAP2) deﬁnes public participation as the involvement of those affected1 by a decision in the decision-making process. We use the term ‘public participation’ to describe these situations, though the same activities are also described as community or stakeholder consultation, engagement and participation. Public participation encompasses a range of public involvement, from simply informing people about what government is doing to delegating decisions to the public. IAP2’s Public Participation Spectrum explains this range and the extent of participation at each level. The spectrum includes ﬁve levels of increasing public engagement. IAP2 refers to the ﬁrst two as ‘participation’ and the last three as ‘engagement’. We describe the ﬁfth level of public participation as 'empowerment' to highlight the signiﬁcant difference in decision-making authority between this level and other levels. The Subordinate Legislation Act 1994—which includes requirements for consultation when amending legislation and regulations. • must make reasonable adjustments for people with disabilities so that they can participate or access a service, including when providing information. What are the aims of this guide? In light of the importance of public participation for informing and shaping government’s decisions and the mixed performance observed in its application in Victoria, we have produced this better practice guide. secondly, it signals the basis upon which we will audit the efﬁciency and effectiveness of public participation in future. To provide balanced and objective information to support understanding by the public. To obtain public feedback on analysis, alternatives and/or decisions. To work with the public to ensure concerns and aspirations are understood and considered. To engage with the public on each aspect of the decision, including the development of alternatives and a preferred solution. To create governance structures to delegate decision making and/or work directly with the public. To keep the public informed. To listen to and acknowledge the public’s concerns. To work with the public to exchange information, ideas and concerns. To seek advice and innovations from and amongst various public parties. To work with the public to implement agreed-upon decisions. The ﬁrst two public participation levels— Inform and Consult—typically occur when a decision has already been made, and government wants to either communicate that decision to the public, or seek opinions on the decision. The third and fourth public participation levels— Involve and Collaborate—have two way information ﬂows, and include sharing information within and across stakeholder communities during the decision-making process. When undertaking Engagement, decision makers commit to using stakeholder feedback to inform the decision and shape the outcome. Activity that occurs at the Collaboration level is also sometimes referred to as partnering. The ﬁfth public participation level—Empower—is also often referred to as co production, where decisions are made jointly between government and the community. 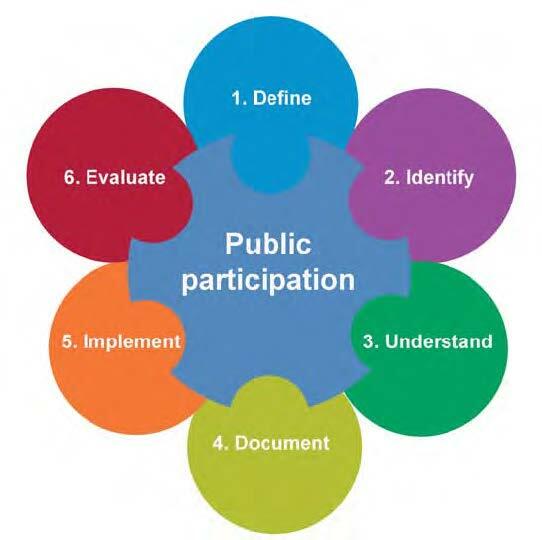 Source: Adapted from the International Association for Public Participation’s Public Participation Spectrum. Public participation better practice guides often include principles to drive and shape agencies’ practices. In Victoria, the Public Administration Act 2004 provides a framework for good governance in the Victorian public sector and in public administration generally in Victoria. This includes fostering ‘a public sector that responds to government priorities in a manner that is consistent with public sector values.’ In Figure 4 we describe the commitments that should shape public participation practices to these values. Figure 3 summarises the practices we would expect to see when examining how agencies approached public participation. evaluating and learning from the process. The approach to public participation in government decision-making needs to reﬂect the scale and purpose of the government decision or project. For example, we would not expect to see the same depth of analysis and documentation for a participation exercise on the $50 000 installation of local trafﬁc management on a suburban street when compared with participation required when investing $1 billion into new public infrastructure. Nevertheless, in both cases, we would still expect to see documentary evidence that agencies had understood and appropriately taken account of these elements in designing and implementing their approaches to the related public participation activities. The aim of the guide is not to develop a set of identical documents, but rather to ensure agency records show alignment with its principles and better practice elements. …identifying and promoting best practice. challenges and opportunities related to the participation exercise. Identifying and promoting public participation better practice in government decision-making. …striving to earn and sustain public trust of a high level. Ensuring that those affected understand the scope of the pending decision, the decision-making process and any constraints on this process. Addressing public and stakeholder concerns in an honest and forthright way and communicating results back to the public in a way they understand. implementing government policies and programs equitably. Embedding in all decision-making processes an openness to appropriately understanding and incorporating the views of those affected by decisions and providing access to all relevant information about the decision in a manner that participants can understand, so that their contributions may be fully informed. submitting themselves to appropriate scrutiny. Being clear about the scope and objectives of the public participation exercise. Demonstrating that results and outcomes are consistent with the commitment made at the outset of the process. Being clear about the contribution participants will be asked to make and the responsibilities associated with this. Providing appropriate time and resources to ensure that those affected can participate in a meaningful way. Making every reasonable effort to include the stakeholder groups and members of the public affected by the pending decision. Making reasonable adjustments where necessary to remove barriers to participation and ensure an inclusive approach. Being aware and taking account of the needs of diverse communities to be able to participate in a meaningful way. actively implementing, promoting and supporting human rights. During our consultations, several organisations commented on the problems that are caused when public sector agencies do not clearly communicate the nature of the decision to be made and the scope of the public participation exercise. For example, it is counter- productive if the public thinks it can inﬂuence a decision that government has already made if the objective of the public participation is to inform people about the decision and work with them to secure a smooth implementation. It is also problematic when the public is being asked to contribute to a decision, but perceives that agencies are closed to their participation. Being clear about the extent to which participants will be able inﬂuence the decision being made is critical to establishing trust and to avoid incorrect perceptions. This also applies to decisions where some aspects or components are open for input, but others are not—for example, due to legal requirements, safety reasons or other non negotiable factors. Earlier in the guide we noted that different levels of the public participation spectrum encompass different levels of public participation. Once the objective of the participation exercise is known, the corresponding objective in the spectrum identiﬁes which level is needed. We will look for evidence of clarity in the decision to be made. A fully-informed description of the planned objectives and scope of the public participation and evidence that these things have been communicated to, and understood by, stakeholders. This is set out in detail below. 1.1 Describing the decision to be made. 1.1.1 There is a comprehensive and clear description of the matter that is being decided. 1.1.2 Agencies are clear about the government’s priorities and their impact on the scope of the decision. 1.2 Taking into account relevant legislation in framing the public participation. 1.2.1 There is evidence that agencies are aware of the full extent of their legal obligations in relation to making the decision and have appropriately designed the public participation exercise in light of this. 1.2.2 Agencies can demonstrate that they have taken into account broader legislative requirements such as human rights in making decisions. 1.3 Deﬁning the objectives and scope of the participation exercise and setting initial expectations around the level of participation. 1.3.1 Agencies have clearly and comprehensively described the objectives and scope of the participation exercise and the level of public participation they are seeking in making that decision. This element captures the stakeholder analysis—who is impacted, how and if they should be involved in the decision-making, and how is this best achieved? While Element 1 framed initial expectations about who should be involved, this element conﬁrms this and determines how to effectively involve these target stakeholders. It is a critical stage because missing those impacted by the decision or approaching affected stakeholders inappropriately undermines the public participation, while including those unaffected by the decision is inefﬁcient. ‘optimal mix’—for example, where the interests of the different stakeholder groups are appropriately balanced, and the views of one group do not overwhelm others. Doing this stage well creates a solid foundation for capturing and understanding the issues of importance to the public that are relevant to the decision. Failing to do this properly risks missing critical issues that may emerge later in the project when it is more difﬁcult and costly to effectively address them. We will look for evidence that all those likely to be affected have been identiﬁed and the potential impacts of the decision have been assessed, together with an assessment of how best to approach those that need to be included in the participation exercise. 2.1 Identifying stakeholders affected by, interested in, or who can inﬂuence or inform the decision. 2.1.1 Agencies can demonstrate that they have identiﬁed all relevant stakeholder groups and members of the public potentially affected by, or holding a legitimate interest in the decision. 2.1.2 Agencies have used available information and, where necessary, undertaken further data collection and research to understand who potential stakeholders are. 2.2 Understanding how stakeholders are affected and the nature and intensity of their interest. 2.2.1 Agencies can clearly link the selection of those included in the participation exercise to an objective analysis of the impacts and interests of stakeholder groups and members of the public. 2.2.2 Agencies have conﬁrmed these impacts by engaging the stakeholder groups and members of the public they expect to be most affected or interested. 2.3 Understanding stakeholders’ capacity and willingness to participate and if participation barriers need to be removed. 2.3.1 Agencies can demonstrate that they have identiﬁed how to most effectively engage with participants, including if barriers to participation need to be removed and if reasonable adjustment is required. 2.3.2 Agencies can demonstrate that they have sought to achieve an ‘optimal mix’ of participants for the exercise—such that an appropriate balance of views is represented. 2.4 Understanding stakeholders’ capacity and willingness to contribute and preferred methods. 2.4.1 Agencies can demonstrate that they have developed a good understanding of the key, potential participants. 2.5 Conﬁrming that stakeholders understand their roles in the decision-making process. 2.5.1 The objective and scope of the exercise have been explicitly communicated to the participants. 2.5.2 Agencies have ensured that participants understand the government’s priorities and their resulting level of inﬂuence on the decision to be made. Engagement mechanisms and tools to facilitate the participation need to be appropriately matched to participants’ needs. A ‘one size ﬁts all’ approach is not likely to provide meaningful input into the decision, and it is not unusual to need a mix of different engagement approaches to facilitate meaningful engagement for different participants. This also includes public participation capability—just like facilities management or HR, public participation is a specialist skill, and so an effective participation exercise may sometimes require engaging additional staff or specialist resources. Identifying the time required for meaningful participation is also essential, and was an issue stakeholders frequently raised with us in developing this guide. Rushed public participation exercises create scepticism amongst participants, and cannot realise the true beneﬁt of participation. We will look for evidence that agencies have identiﬁed the resources, skills and time frame required to undertake the participation exercise as deﬁned under Element 1. 3.1 Describing the resources required to ensure an effective participation process. 3.1.1 Agencies can demonstrate that the resources identiﬁed are sufﬁcient and appropriate to achieve the objectives of the participation exercise. 3.2 Identifying the skills necessary to meaningfully engage with all participants. 3.2.1 Agencies have identiﬁed the specialist skills or assistance that may be required to carry out the participation exercise, and how to source them. 3.2.2 Where appropriate, agency staff have undertaken any training necessary to enable them to effectively facilitate the participation exercise. 3.3 Estimating the time required to ensure an effective participation process. 3.3.1 Agencies can demonstrate that the time frames identiﬁed are sufﬁcient and appropriate to allow for meaningful participation. It is important that public participation exercises, like any other project activities, are clearly documented in a plan that is the end-to-end roadmap for successful implementation. The length and detail of the documentation will depend on the scale and complexity of the public participation exercise. However, the underlying aims remain the same—to clearly and adequately document a plan of action for agencies to follow and use to assess whether they are achieving the objectives of the public participation exercise. For example, the plan for a local council that is commissioning a survey about changes to a local park will need to meet all of the requirements. By comparison, the level of detail about things such as the resources and skill sets required, and the approach to monitoring and evaluation, is likely to be greater for public participation in decision-making around statewide urban planning. Setting out a clear plan for implementing the participation exercise is critical to following through on the essential planning work undertaken through Elements 1, 2 and 3. We will look for evidence of a plan that is appropriately customised to the participation exercise. 4.1 Documenting the ﬁnalised public participation decision, objectives, scope, stakeholders included and the approaches to be used. 4.1.1 Agencies have clearly described these foundational aspects of the plan and explained the rationale underpinning them—see Elements 1, 2 and 3. 4.1.2 Agencies can demonstrate a clear and equitable process for engaging with stakeholders, including understanding and responding to any concerns. 4.1.3 Agencies’ plans incorporate effective mechanisms for communicating the results of the public participation activities to stakeholders, including how these were used in the decision-making process and the ﬁnal decision made. 4.1.4 Agencies have documented how they will capture the participants’ input to inform the decision being made so that the resulting records are a complete and accurate reﬂection of the participation. 4.2 Identifying the risks that threaten the objectives and how these will be monitored and managed. 4.2.1 Agencies have identiﬁed the risks to the objectives of the public participation exercise—particularly those that rate highly. including situations where time or resource constraints have meant a compromised approach to public participation. 4.3 Setting the governance and management structure for achieving the objectives. 4.3.1 Agencies have deﬁned a management structure for the public participation exercise that has the capacity to successfully deliver and monitor the exercise while deﬁning clear responsibilities for achieving the objectives. The approach needs to have appropriate senior management endorsement. 4.4 The monitoring, feedback and evaluation processes. 4.4.1 Agencies have clearly described how progress will be measured in terms of time lines, resource use and achieving the public participation objectives. 4.4.1 Agencies have put in place a clear approach for evaluating success, including outcome measures to assess the achievement of objectives and a post-participation process for evaluating and reporting on the success of the exercise. A good plan is irrelevant if agencies are not capable of, or committed to, applying its actions and successfully managing the risks that affect its progress. This element focuses on how well the public participation process is monitored and managed. We will look for evidence that public participation exercise has been implemented as described in the plan. 5.1.1 Agencies can show how they applied a planned approach by completing intended actions according to the objectives, time lines and resources documented in their plans. 5.2.1 Agencies have evidence that they monitored expenditure, progress against time lines and progress towards achieving the intended objectives of the public participation exercise. While the amount of effort should be tailored to the scale of the project, all public expenditure should be evaluated to conﬁrm that it achieved the intended result. Over many years the poor evaluation of projects has been a recurring ﬁnding in VAGO’s performance audits. Failing to evaluate public participation means agencies have no clear understanding about whether they have successfully engaged the community and achieved the objectives of the public participation exercise, and whether they should address any weaknesses and learn from their experiences in future public participation exercises. We will look for evidence that agencies have, after completion of the public participation exercise, evaluated the outcomes against the objectives, and documented the lessons and recommendations for improvement. 6.1 Assessing whether they have achieved public participation objectives. 6.1.1 Agencies have applied a clear and appropriate evaluation framework to assess the success of the public participation exercise against the objectives set at the outset. 6.1.2 Agencies have consulted the stakeholders involved to understand their perceptions of the weaknesses and strengths of the public participation exercise and potential areas for improvement. documented the results of the evaluation. 6.2 Documenting and applying the lessons. 6.2.1 Agencies have adequately identiﬁed areas for improvement and documented a plan for integrating these into their ongoing operations. This guide draws heavily on the work of the International Association for Public Participation (IAP2), an international member association that seeks to promote and improve the practice of public participation or community engagement. IAP2’s Public Participation Spectrum—designed to assist in selecting a public participation level that deﬁnes the level of public stakeholder inﬂuence in the decision-making process—is a key foundation of this guide. IAP2 also produces other resources that may be useful to government agencies seeking to enhance their public participation practices, including the Journal of Public Deliberation—a peer-reviewed, open access international journal. In addition to drawing on the work of IAP2, we reviewed a wide variety of documents and other resources on public participation in developing this guide. We also received useful information from stakeholders highlighting a range of organisations, groups and other structures currently in place whose work relates to public participation. A sample of these references and resources are contained in this attachment, which may be useful for agencies seeking further information to guide their public participation practices. A suite of materials to assist Queensland public servants engage communities in government decisions and processes. A guide to enable government, non-government organisations and Indigenous people to build mutual respect, identify responsibilities and share aspirations through active and meaningful engagement. A framework for thinking about the most effective and appropriate ways to involve the community to design and conduct community participation programs. A guide to support directorates to improve community engagement planning and practice. A set of broad engagement principles, rather than a prescriptive ‘how to’ guide. A set of guidelines for Tasmanian Government agencies to undertake community engagement. While publicly available documentation refers to this framework, we could not locate it in a public search. These principles include that a council must develop a program of regular consultation with its community in relation to the services it provides. The Act requires local governments to develop a minimum 10-year community strategic plan that is informed through engagement with the local community. Aims to provide a model framework to adapt to local circumstances for planning and implementation of community engagement processes. While publicly available documentation refers to this guide we could not locate it in a public information search. Provides a context to the community engagement resources on the Department of Local Government’s Integrated Planning and Reporting website and discusses the alignment of community engagement to the Strategic Community Planning process. From 1 July 2013, local governments will be required to provide evidence of their community engagement in the Strategic Community Plan. The Victorian Government’s policy on consumer, carer and community participation in the health care system. A step-by-step approach to developing a community participation plan. An internal document to support client engagement. Department of Education and Early Childhood Development Stakeholder Engagement Framework (2011) A set of tools and resources to enable the department to meet the government’s commitment to increase stakeholder engagement and form genuine partnerships with families, communities, businesses and non-government organisations. Book 3 – workbook Engagement toolkit A planning guide that captures and shares information about tools widely used in engagement activities. Department of Premier and Cabinet Victorian Government Accessible Communication Guidelines (2014) A set of guidelines to assist us in providing communication materials in formats that ensure the information will reach all Victorians. Note: These guidelines do not include those that exist at a portfolio agency level, departmental division or business unit level, or those that focus on public participation in relation to a specific matter—Consumer Affairs, Emergency Relief, Mining and Mineral exploration, etc. The existence of these documents does not necessarily imply that they are applicable department-wide—including portfolio agencies and individual business units. Note: Department names have now changed due to machinery of government changes on 1 January 2015.
building the evaluation and evidence-base around engagement. local Aboriginal education consultative groups. The Victorian Local Governance Association (VLGA) is a member based organisation for local government, councillors and community leaders, focused on strengthening the capacity of local governments to engage with their communities. The VLGA has a range of resources designed to assist readers in undertaking successful public participation. In public participation, agencies need to ensure that stakeholder selection is inclusive and that the design of participation activities facilitates the full participation of those with particular needs. Below are several resources that can offer expert advice and assistance in designing and delivering an inclusive process. The Victorian Equal Opportunity and Human Rights Commission is an independent statutory authority that is Victoria’s lead agency in promoting and protecting human rights. It provides an impartial dispute resolution service, works to eliminate discrimination through project and policy advocacy and the provides public information, education, training and consultancy services on equal opportunity and human rights and responsibilities. The commission offers a range of guides, training and other tools designed to assist organisations in using a human rights and equal opportunity based approach to decision-making. running programs that help people with a disability to speak for themselves and protect their rights. AAV is the Victorian Government’s central point of advice on all aspects of Aboriginal affairs in Victoria, including information on state Aboriginal organisations, cultural heritage contacts and further information. planning and supporting community initiatives such as homework centres and cultural identity projects. CHP is Victoria’s peak body for organisations and individuals with an interest in and commitment to ending homelessness. CHP’s website includes resources aimed at supporting practitioners and local communities to implement best practice and improve outcomes for people who are experiencing, or at risk of, homelessness. Our first step in developing this guide was to draw on Australian and international literature and guidance on the subject of public participation. We looked at better practice frameworks in other jurisdictions and also reviewed our previous performance audits that had touched on issues related to community consultation and public participation. This informed our initial consultations with a range of public sector and other stakeholders. We spoke to a number of Victorian public sector agencies across a range of sectors about how they undertake public participation in their decision-making processes and how participants view those processes. This initial consultation involved 16 stakeholders including large government departments, small agencies, regulatory and policy advisory bodies, local councils, community representative organisations and advocacy groups. Our consultation involved face-to-face meetings and reviewing documents they shared with us. This gave us insight into the nature of public participation exercises they undertake, the factors that guide their public participation exercises and the challenges they face. We used this to inform the principles, key elements and requirements of our better practice guide. Drawing on our review and consultation activities, we developed an exposure draft that set out the principles, key elements and requirements that we believe should guide public participation exercises. We made our exposure draft publicly available on our website and invited feedback on the usefulness and the content of the guide. We promoted the opportunity for feedback through a series of meetings with public sector agencies, audit committee chairs, social media networks as well as the initial list of stakeholders we consulted. We received feedback from 47 stakeholders through a simple anonymous online survey and more detailed written comments and submissions from a further nine stakeholders. Overwhelmingly the feedback received supported the aims and usefulness of a better practice guide to improve public participation in government decision-making, and provided a number of useful suggestions to further focus and clarify the intent of the guide. Many of the comments also highlighted the challenges with undertaking good public participation, which we have drawn on in the guide. This is the first version of our Public Participation in Government Decision-making: Better practice guide. We have published it on our website and intend to undertake a series of public presentations to promote its availability as a resource for public sector agencies. We intend to undertake a series of performance audits commencing in 2015–16 that examine how Victorian agencies are undertaking public participation in government decision-making, and we will use the elements set out in the guide to assess those public participation exercises. We hope that these audits will provide examples of good practice and areas where performance needs to improve. We will use these audits to inform future updates to this better practice guide.